I have had a couple of similar products in the past and I really like the idea of a self-closing screen on my doors. Obviously I'm not getting as much use out of it this time of year as I will be during the summer months, but with the warmer weather we have had this year, I have still had ample opportunity to test this product for short periods of time while doing such tasks as carrying in groceries. Installing the Premium Magnetic Screen Door was pretty straight forward. My son was easily able to put the screen on our doorway in just a few minutes. 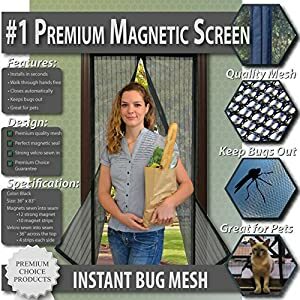 The door pulls open easily and snaps back together with the magnets, keeping any insects out during the summer hours. As for now, it keeps my dog from running out the door since she sees that there is something there and doesn't try to go through it until it is opened for her. It seems sturdy enough to hold up to our usual traffic, so I am sure that I will enjoy having this on the door a lot more this summer when the insects are more plentiful.